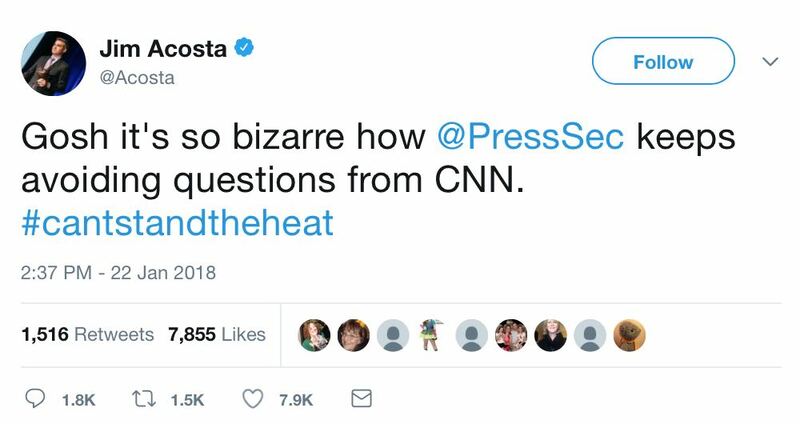 CNN's Jim Acosta has had a rough four days. It's hard not to take some pleasure in that situation, given the Chief White House Correspondent's habitual rudeness and petulance with President Trump, and with his representatives during White House press briefings. MULVANEY: You any as well as anybody it takes 60 votes in the Senate to pass appropriations bill, right? You know that. MARC SHORT: I think it’s a reflection, candidly, of the position that many in the Democrat Party find themselves in, for this reason. I think that many Democrat activists have looked at all the administration has accomplished over one year, and they’ve pushed their leadership to say we want something to shut down the government. Meaning, they look back say, "the largest tax cut in history." They say, "you repealed the individual mandate." They look at the regulatory rollback. They look what’s happened with $7 trillion added to the stock markets. They see more circuit court judges (than) ever confirmed in one year. They see a new Supreme Court justice confirmed. Those are things we look at as tremendous progress. But I know that they're captive by a small base in their party, and they're saying, "We demand a shutdown." So I do think they're related. They look at the accomplishments of the last year and all that this administration has accomplished, and their reaction is: "Because we can’t beat them, we’re going to shut down the government." Apparently, the humilations he received on Friday and Saturday sent the intrepid Costa into investigative-reporter mode, seeking tangible evidence of disastrous shutdown impacts. Geez, you really can't make this stuff up. 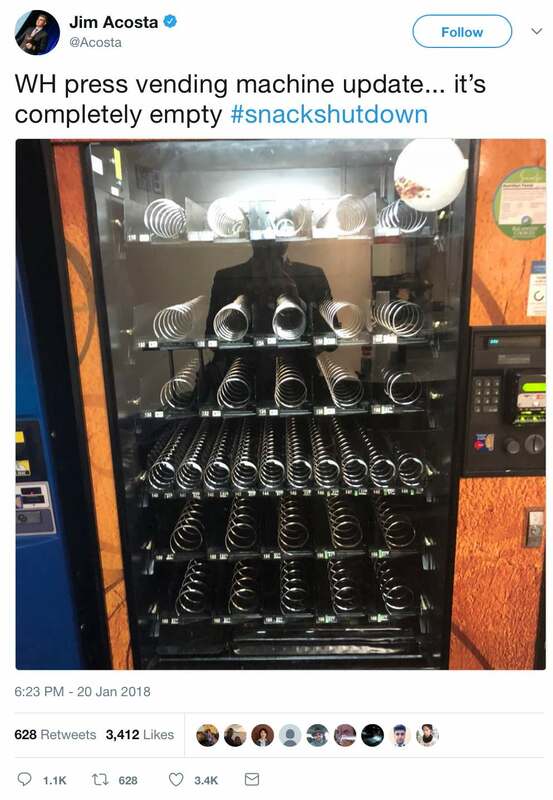 Did it ever occur to Acosta that, unlike most weekends, the White House was heavily staffed on Saturday because of the shutdown, purchased all available snacks, and had better things to do than call for a machine refill? Given the results seen on Friday and Saturday, Sarah Sanders did Acosta a favor by not calling on him or anyone else at CNN on Monday — especially because, by most accounts, the shutdown ended because Senate Democrats "couldn't stand the heat" (even Nancy Pelosi said so), and caved. If there was a Guinness World Record for most self-important, self-absorbed, unaccomplished reporter in Washington, Jim Acosta would be its holder, hands-down.